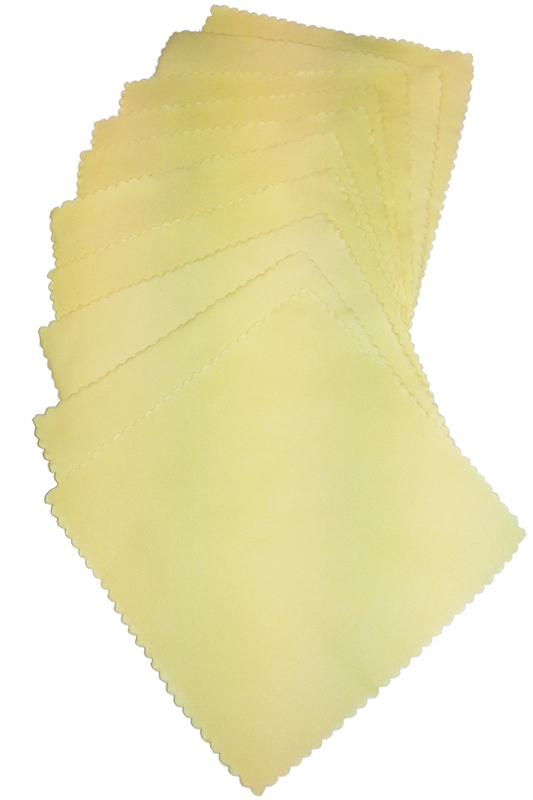 Buy more and save with this ten pack of cleaning cloths. If you don't need this many, we also sell single pieces separately, but this large package allows anyone buying several, to do so at the lowest possible price. Remove greasy fingerprints, wipe away food chunks, polish the screen, and so much more. The advanced fabric will completely clean any surface of your phone, and you won't need any sprays or additional chemicals to do so. It's safe for use on any portion of your mobile device, but it's also great for other delicate surfaces like camera lenses, TV screens, sunglasses, monitors, jewelry and more. Other versions are made with cheap material so they just glide over grime, or spread it around. This one lifts it up, and absorbs it with very little effort. In most cases, a single swipe with a dry cloth will completely clear the screen, while leaving behind absolutely no streaks, spots or lint. They come in a 6" x 6" size, and each one will last for a thousand or more uses because they are totally machine washable. Quick. The ultra suede material offers greater surface area and improved performance. Clean and polish with one motion. Lift and absorb any kind of dirt with one quick wipe. Thorough. Other cloths smear fingerprints, leave behind lint, or glide right over the dirt. This one powers through anything to completely clean the surface with very little effort. Reusable. More convenient and less costly in comparison to disposable options, this phone cleaning cloth can be used over and over again. Machine Washable. It won't need to be laundered after every use, but when it does get too dirty, just toss it in your washing machine to clean it. High Quality. The improved material does all of the work, so it easily outperforms others that look the same. Avoid knock off versions to ensure outstanding performance and long lasting durability. No Risk. It will never scratch or leave a mark, and it's completely safe for any device. No moisture is required for cleaning, so you run no risk to sensitive electronics. Only want one or two? We also sell this cloth in singles for those that don't want ten. Need one that's a little bit bigger? We have many other options for those that would prefer a larger size. The list that follows includes cloths with the same material, and some with fabric that's similar, but equally suited for the same jobs. 5" x 8", 8" x 8", 9" x 10.25", 12" x 8.5", 12" x 12", and 16" x 16". There is no easier, or more fool-proof way to clean your phone. In most cases, you'll keep it totally dry, but you can also add a samll amount of water to increase cleaning power and remove any stubborn dirt. The low level of moisture required will dry in less than a second, so it will pose absolutely no risk to your device. For regular dirt, and everyday build up, just wipe with a dry cloth. Wipe any surface of your phone to clean it. Screen, back, front, case, it doesn't matter, this cloth is safe and effective anywhere you use it. Use a back and forth motion, or a circular one. Start in one area, and move methodically to avoid missing anything. A single pass will remove most grime easily. For anything else, get the cloth damp to supercharge it's ability. To wet, soak with water from the faucet and then wring out until no longer dripping. Less moisture is better for this job, so make sure it's not too wet. Once damp, cleaning power will be increased, so any stubborn dirt will now wipe off with ease, and because the moisture level is low, you run no risk of damage. Start to finish, the whole process should take under a minute. For maximum safety, and to prevent any damage or unwanted downloads, turn the power off prior to wiping. To clean, hand or machine wash, then hang or tumble dry. Top quality fabric lifts dirt instead of moving it around. Don't settle for cheap alternatives or risk damage by spraying on liquids. Order in this 10-Pack and save. Order Yours Today! I purchased these Cleaning Cloths for a specific project in our organization's computer (IT) department. They work great for the project we purchased them for. In addition, everyone uses them for their eyeglasses, their phones,etc. all with great results. They don't have lint or any of the problems that some of the other cloths have. We are going to order more because they are a big hit here at our company. In my opinion,these are a winner.I am in no way associated with the company that sells these cloths and this review is my honest opinion of my experience with these cloths.